Protecting Beaches, Waves And Wildlife From The Marine Litter Crisis Haunting the UK Coastline. 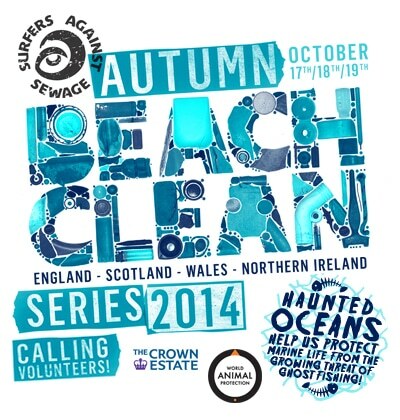 The Autumn Beach Clean Series – 17th – 19th October 2014: Community Beach Cleans Tackling Marine Litter in England, Wales, Northern Ireland & Scotland. Surfers Against Sewage, The Crown Estate and World Animal Protection (WAP) are appealing for volunteers to lead community beach cleans as part of the Autumn Beach Clean Series this October, to protect UK beaches, waves and wildlife from the marine litter crisis haunting our coastlines. We’re delighted to be working with The Crown Estate for the fourth-consecutive year to deliver these enjoyable and empowering community beach clean events across England, Wales, Northern Ireland and Scotland. The initiative aims to attract 3,500 volunteers to 150 coastal locations including some of the country’s best-loved and most iconic beaches, surf spots, coastal habitats and holiday resorts, making this our biggest ever Autumn Beach Clean Series! This October, on the advent of Halloween, we will also be collaborating with World Animal Protection to deliver beach clean events and raise the profile of the growing threat of ghost fishing gear. Ghost fishing gear is the term used for lost or abandoned commercial fishing gear that continues to indiscriminately catch, injure and kill fish, marine mammals, seabirds and other wildlife in our oceans. Alarmingly, over 640,000 tonnes of fishing gear are left in oceans globally each year. That’s almost 2000 tonnes every single day. In the tangle net fishery off the southern tip of Cornwall it was recently found that 18 vessels lost a total of 263 nets per year. This amounted to a total length of 24km; only around one third of these nets were recovered . Although the full scale of the ghost gear problem in UK waters is currently unknown, it is clear that entanglement in ghost fishing gear is a significant threat to the welfare of many animals. SAS and World Animal Protection are working to uncover the scale of this issue and what it really looks like in the UK. Unexpected animals such as the Leatherback turtle are impacted by ghost gear in our waters. Late summer and autumn is a critical time of year for Leatherbacks as they migrate to our waters to feast on blooming jellyfish populations off the north west and south west coasts. Sadly significant numbers of these beautiful animals become entangled in ropes and netting . To combat this, Autumn Beach Clean Series volunteers will be surveying and reporting on any fishing line, netting or other ghost gear at October’s beach clean events. Surfers Against Sewage beach clean events are a wonderful opportunity for communities to come together to take direct action on marine litter and provide an engaging, interactive educational platform on the threat, scale and solutions to the marine litter crisis. SAS’s Beach Clean Team are on hand to help you organise your own Autumn Beach Clean, so get in touch on [email protected] or call 01872 553 001 and become a marine litter activist today. Want to get started straight away? Just follow this link to our step by step guide to organising your own SAS beach clean. SAS’s rapidly expanding programme of beach clean events help remove marine litter directly from the environment, raise public awareness, and complement longer term initiatives that aim to tackle marine litter at source including Return To Offender, Break the Bag Habit, Think Before You Flush and No Butts on the Beach. For further information on the Autumn Beach Clean Series please contact Dom Ferris on 01872 553 001 or email [email protected] Alternatively, please check www.sas.org.uk for more details. Surfers Against Sewage is delighted to be working with The Crown Estate on the Autumn Beach Clean Series. Their support is helping us reach out to coastal communities across the UK to protect beaches, waves and wildlife from the tide of marine litter washing up on our coastline. We are also excited to involve World Animal Protection to assess the level of ghost fishing gear on our precious beaches and safeguard marine wildlife from this emerging threat haunting our oceans. We are delighted to support Surfers Against Sewage in their efforts to mobilise coastal communities in protecting beaches and coastal habitats from the threat of marine litter. We hope that through these events individuals will not only have a greater opportunity to play a part in protecting their favourite beaches, but also gain an understanding of how The Crown Estate is working to deliver a sustainable future for UK coastlines and coastal communities. World Animal Protection’s Sea Change campaign aims to protect the some 8,000 marine species, including whales, dolphins, porpoises, seals, seabirds and turtles that live and breed around the coasts of the British Isles from the devastating impact of ‘ghost gear’ and we are working to uncover what this issue really looks like in the UK. We hope the Autumn Beach Clean Series will give people a chance to find out more about this largely unknown issue, help monitor the scale of the problem on UK beaches and identify positive solutions to exorcise our haunted oceans.